If this Tribute Summoned card battles an opponent's monster, during damage calculation: You can make that opponent's monster lose 500 ATK for each face-up Pendulum Monster currently in your Extra Deck, until the end of this turn. 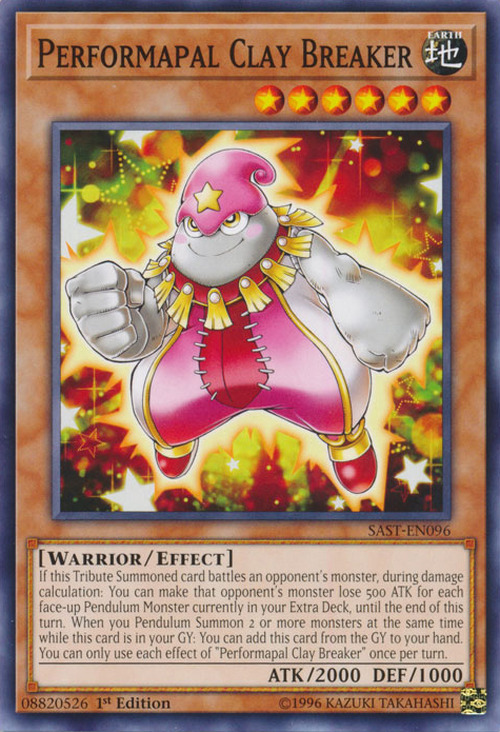 When you Pendulum Summon 2 or more monsters at the same time while this card is in your GY: You can add this card from the GY to your hand. You can only use each effect of "Performapal Clay Breaker" once per turn. This card strongly resembles Oogie Boogie from The Nightmare Before Christmas, as both are anthropomorphic burlap sacks with a curled head like a Santa hat.